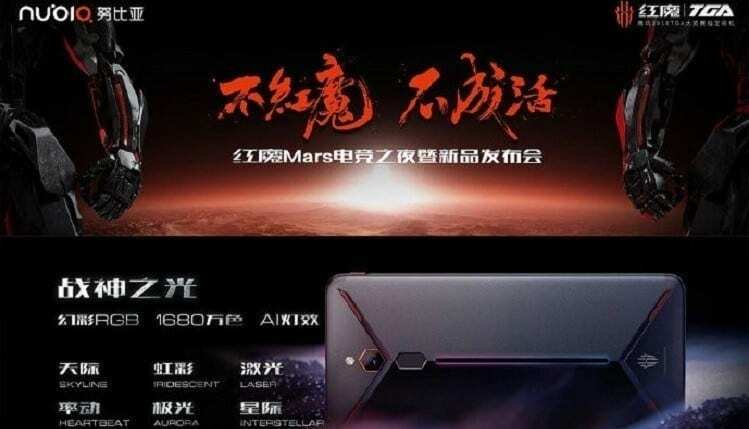 Six months after the launch of the first model in the range, Nubia Red Magic Mars arrives : the new smartphone aimed at the Chinese company’s gaming arrives with a renewed design, a more powerful processor, more RAM and other details that we will see later. Nubia, however, went on the safe side, especially after the good success obtained by the predecessor. Nubia Red Magic Mars comes with a 6-inch IPS LCD display with Full HD resolution; the processor this time is the new Snapdragon 845 , while the available versions will be 3 and depend on the amount of RAM + internal storage (6 + 64 GB, 8 + 128 GB and 10 + 256 GB). The 16 MP rear camera with an aperture of f / 1.8 (backward with respect to the 24 MP of the Red Magic) and the front 8 MP camera have to be noted. The battery is 3,800 mAh, there is a USB Type-C port and the 3.5 mm audio jack; on board also Android Pie 9 with Red Magic OS 1.6. Several details designed for a gaming experience closer to that of portable consoles: there is a new liquid cooling system, stereo speaker with DTS 7.1 to ensure different directions of sound, haptic feedback with new technology “4D Shock ” . And again: it will be possible to connect the controllers via bluetooth, while on the back there will be a strip of colored LEDs that gives a very striking effect. Also present a physical button through which you can activate eSport to “isolate” during gaming sessions. Nubia Red Magic Mars is currently only available in the Chinese market (no indication for an eventual arrival in Europe): according to the current exchange rate will cost 345, 410 and 510 for the three versions above.